Welcome to the Crescendo Analysis Labs, an online laboratory devoted to creative and philosophical experiments in Crescendo Analysis. Crescendo Analysis defines an approach to both analyzing and creating various kinds of rhetorical communication, literature, photography, film, and fine art in which either the creator or the critic moves from detailed, specific information into broader, more general information for the purpose of creating a comparison or extending and enlarging an explicit or implicit argument. For a complete definition of Crescendo Analysis with examples: Crescendo Analysis Defined. If you have a Crescendo Analysis experiment of your own, submit it for publication in this lab: Contact. A Crescendo Analysis of images in James Joyce's short story "The Dead," from Dubliners. A Crescendo Analysis of The Great Gatsby by Pablo Rocha, focusing on Nick Carraway's privilege. 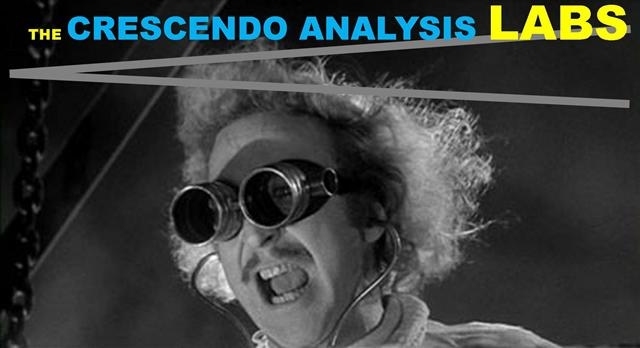 Examples of Crescendo Analysis in film. Films include American Beauty,Brubaker, and Inception. Andrew Wyeth's Crescendo Analysis in "Christina's World," including both Wyeth's use of Crescendo Analysis and a Crescendo Analysis of the painting itself. and No Country for Old Men.